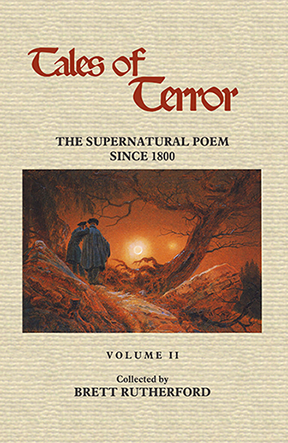 TALES OF TERROR: THE SUPERNATURAL POEM SINCE 1800. VOLUME 2. 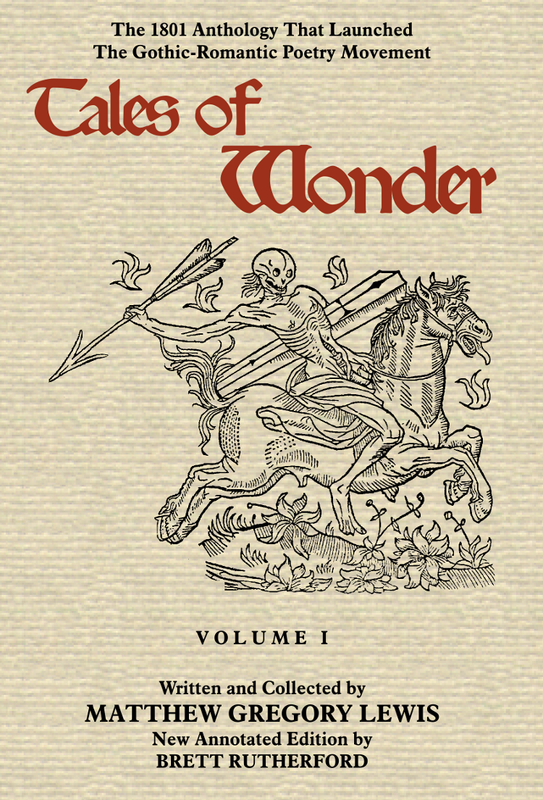 This annotated edition of 136 supernatural-themed poems is the second part of a modern sequel to Matthew Gregory Lewis’s famous 1801 poetry anthology, Tales of Wonder. As might be expected, several of the best-known horror writers who were also poets are here, including H.P. Lovecraft, Clark Ashton Smith, and Frank Belknap Long. But surprises abound as ghosts, goblins, fairies, monsters, and cosmic doom escape the pens of poets from the United States, Britain, Ireland, Australia, Switzerland, and Germany. Treasures to be found in this volume include the lore of The Flying Dutchman, arctic werewolves, an octopus-woman, a rampaging Sphinx, malevolent fairies, house ghosts, a painting fatal to look upon, Santa Claus’s evil cousin, the Phantom of the Opera, mad scientist Nikola Tesla, “women scorned” with revenge in mind — plus the inevitable sea serpents, Gorgons, vampires, and the hungry slime mold that ate Providence, Rhode Island. This volume samples the best supernatural-themed poems from the 1890s to about 1930, and then leaps forward to offer over a hundred pages of Gothic works by contemporary poets working in a variety of styles. For the poetry lover, and for the fan of supernatural literature, this book is a year-round Halloween treat of entertaining and alarming poems to read aloud — bedtime stories for very bad children. For the scholar of the Gothic, it presents an intriguing array of poems that range from overtly entertaining Gothic narratives, to works that employ the devices of the Gothic for other ends, social, political, or personal. The book also includes a cumulative bibliography of source materials on the supernatural and Gothic in poetry. Published May 2016. 6x9 inches, paperback. 348 pp. ISBN 0-922558-84-1 $19.95. COMPLETE YOUR COLLECTION WITH VOLUME 1! TALES OF TERROR: THE SUPERNATURAL POEM SINCE 1800. VOLUME 1. Terrifying Supernatural Poems and Ballads by Coleridge, Shelley, Scott, Byron, Robert Browning, Christina Rossetti, Poe, Longfellow, Heine, Baudelaire, Hugo, Pushkin and others. 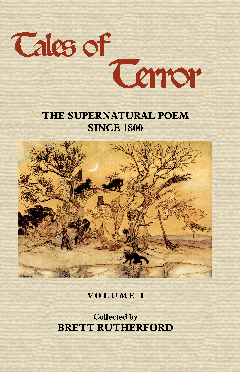 This annotated edition of 65 memorable supernatural-themed poems is a modern sequel to Matthew Gregory Lewis's famous 1801 poetry anthology, Tales of Wonder. Treasures in this volume include two translations of scenes from Goethe’s Faust by Coleridge and Shelley; supernatural verses and ballads gleaned from Sir Walter Scott’s Waverly novels; Shelley’s supernatural poems, both juvenile and mature; Longfellow sharing ghost stories from The Song of Hiawatha, and fierce legends from Norse myth and history; all of the overtly supernatural poems of Edgar Allan Poe; Robert Browning’s famed “Pied Piper of Hamelin”; Christina Rossetti’s delicious “Goblin Market”; and a feast of shuddery French, Russian, and German poems in translation from Hugo, Heine, Gautier, Baudelaire, Pushkin and Sologub. For the poetry lover, and the fan of supernatural literature, this book is a year-round Halloween treat of entertaining and alarming poems to read aloud — bedtime stories for very bad children. For the scholar of the Gothic, the volume presents an intriguing array of poems that range from overtly entertaining Gothic narratives, to works that employ the devices of the Gothic for other ends, social, political or personal. The book also includes an annotated bibliography of source materials on the supernatural and Gothic in poetry. 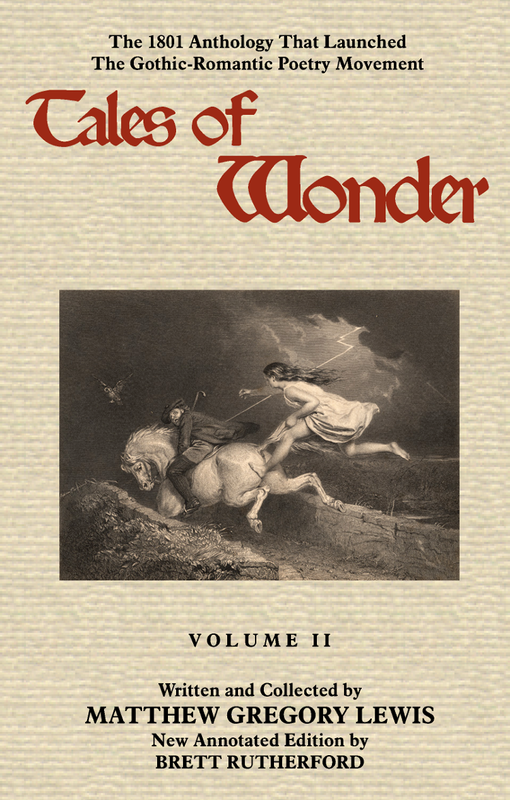 This series is designed to be continuous with our two-volume edition of the Monk Lewis anthology, Tales of Wonder. 314 pp., illustrated. The 213th publication of The Poet's Press/ Yogh & Thorn Books. 6 x 9 inches, paperback. ISBN 0-922558-80-9 $19.95. Available soon in U.S., UK and Europe from Amazon. BRETT RUTHERFORD. DOCTOR JONES AND OTHER TERRORS. This full-color chapbook, now in its second printing, combines two terrifying poems about “Dr. Jones,” a perhaps-imaginary, perhaps-real mad surgeon whose speciality is cutting off arms and legs from young boys in rural Pennsylvania. Rutherford here presents a disturbing sequel to an already-disturbing childhood recovered memory. In “Torrance,” the links between Doctor Jones and Western Pennsylvania's legendary, dreaded state mental hospital are revealed. 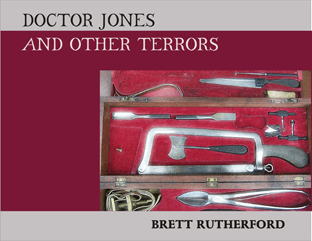 Color digital art reveals Dr. Jones' vintage car, his medical kits, and images of the present-day ruins of the state hospital, where ordinary mental patients were mixed with the criminally insane. 32 pp., 8.25 x 6 inches, paperback, ISBN 0-922558-75-2. $7.98. Available soon in U.S., UK and Europe from Amazon. BRETT RUTHERFORD. WHIPPOORWILL ROAD: THE SUPERNATURAL POEMS (Expanded and Revised 5th Edition). THREE BOOKS ON THE LANCASHIRE WITCHES. The most infamous and widely published witch trials in the Seventeenth Century were the cases of the Lancashire witches, including many confessed practitioners of healing and magic and spells (including calling up thunderstorms and killing livestock). Royal persecution of Catholics and heretics added to the atmosphere of paranoia. Here are three free books with everything you ever wanted to know about English witchcraft. First, a representation of the witches on stage. Here is the full text of The Lancashire Witches and Tegue o Divelly, the Irish Priest, a comedy acted at the Duke's theater. Written by Tho. Shadwell. London, J. Starkey, 1682.--"The late Lancashire witches. A well received comedy, lately acted at the Globe, on the Bankside, by the King's Majesties actors. Written by Thom. Heywood and Richard Broome ... London, B. Fisher, 1634." This exquisite reprint from 1853, with annotations by James O. Halliwell, was a private edition limited to only eighty copies. CLICK HERE TO READ. Next, from 1849, comes a book-length recreation of the witch trials by William Harrison Ainsworth, lavishly illustrated. This book was scanned and proofread and made available free by Project Gutenberg. CLICK HERE TO READ. Finally, for a book from the period of the witch trials, Potts's Discovery of Witches in the County of Lancaster, a 1745 reprint of the original edition of 1613, with an introduction and notes by James Crossley. This is another Project Gutenberg production with all the original typographic decorations and illustrations. CLICK HERE TO READ. WITCHES AND THE ARROGANCE OF INTELLECT. Cotton Mather was, by many accounts, the most learned man in New England when the Salem Witch Trial madness seized New England. 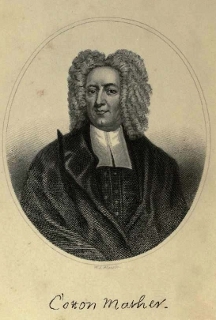 Mather's terrifying sermons about witchcraft and his account of the trials, Wonders of the Invisible World (a transAtlantic sensation published in 1693) marks him as a study in the folly of "wise" men who take Scripture literally. His interpretation of the "evidence" against the accused displays the all-too-familiar trait of allowing every coincidence to be admitted as proof of a vast conspiracy involving Satan, demons, and the poor denizens of Salem Village. Even after the trials were repudiated by the Crown, Mather persisted in his belief in the bewitchings and the guilt of the accused. Leaping to his son's defense, Increase Mather, president of Harvard College, published his own Account of the Trials of the New-England Witches, not only making a fool of himself but forever associating Harvard with the Salem atrocities. The writings of both Mathers has chilling lessons for the present day. We almost hear one of the current crop of drooling religious maniacs (Glenn Beck, anyone?) when we see how Cotton Mather amasses his paranoia with lines like "The children of New England have secretly done many things pleasing to the Devil." These books provide additional evidence that the great mass of published sermons are a blot on Western literature. We are pleased to offer, for the student of history or of the occult, the twisted and tormented sermonizing and testimony of two learned men who persisted in their folly long after the rest of the world had turned away in shame from the madness that was Salem. These are 19th century reprints with very legible type. 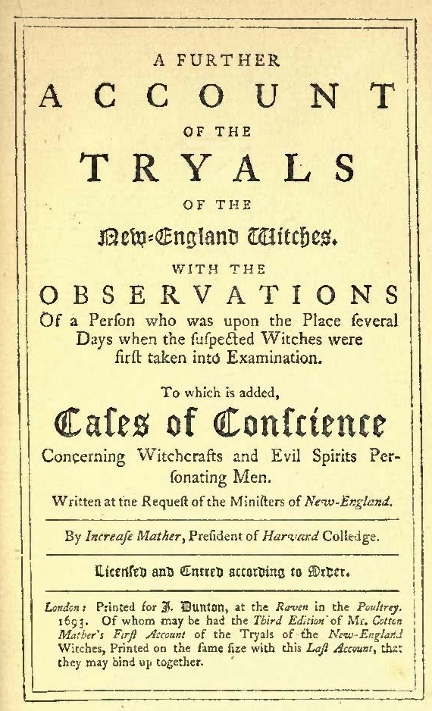 Click over the titles to download and read Cotton Mather's Wonders of the Invisible World and Increase Mather's A Further Account of the Trials of the New-England Witches. We will add links to the first editions when we come across them. These PDFs are based on documents at The Internet Archive. 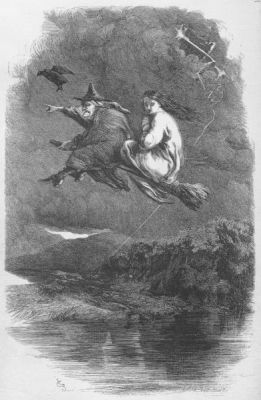 You can view the original edition of A Further Account of the Trials of the New-England Witches at Cornell University's Witchcraft Collection. Their presentation lets you flip between the originak printed pages and the plain-text version of book's text. OR BEDTIME STORIES FOR VERY BAD CHILDREN. This edition, annotated by Brett Rutherford, traces the literary origins of the poems and the stories behind them, connecting them to the long line of eccentric antiquarian scholars who collected classical, Runic, English and Scottish manuscripts or folk material. The poems here also reveal the late-18th century British project of constructing a pagan pre-history for England, building a poetic connection to Nordic legends and bringing Wotan/Odin and the gods, monsters and fairies of the forest into competition with Biblical and Greco-Roman lore. This volume includes early poems by Sir Walter Scott and Robert Southey, as well as poems by M.G. Lewis, Goethe, Herder, Bürger, Mickle, Bunbury, and Leyden. The originals of these poems and ballads are from Greek, Latin, Icelandic, Danish and German, as well as English and Scottish supernatural ballads. For the poetry lover, and the fan of supernatural literature, this collection offers a year-round Halloween treat of entertaining and alarming poems to read aloud ... bedtime stories for very bad children. A Yogh & Thorn Book. Published October 2010; updated second printing March 2012. Paperback ISBN 0-922558-61-2. 246 pp., 6 x 9. $16.95. MATTHEW GREGORY LEWIS. TALES OF WONDER, VOLUME 2. Edited and annotated by Brett Rutherford. This second volume continues the mayhem with Ben Jonson's song for 13 witches, a clutch of famous Scottish ghost ballads, a journey to an Irish cave that opens into Purgatory, a Russian prince's date with Death after 300 years of bliss in the Land of Felicity, the dangers of lingering at Tim Lin's well, the mysterious death of King Arthur, and the most terrifying horseback ride in all literature, Bürger's "Lenora." Information about the poets, source texts and alternative versions enrich the reader's experience of these thrilling Gothic narratives in verse. Poets include Robert Burns ("Tam O'Shanter" with 187 annotations! ), Ben Jonson, Richard Glover, David Mallet, Thomas Parnell, John Dryden, Thomas Lisle, Thomas Gray, Thomas Percy, Robert Southey, M.G. Lewis, Robert Lambe, and William Taylor of Norwich. The book includes more than 500 informative annotations, maps, illustrations, and an extensive bibliography. No other edition of Tales of Wonder contains these additional materials. A Poet's Press/ Yogh & Thorn Book. Published March 2012. Paperback ISBN 0-922558-62-0. 294 pp., 6 x 9, $16.95. NEW EDITION FOR 2009. SHIRLEY POWELL'S OTHER ROOMS. Shirley Powell is one of a small circle of poets who astonished New York and other poetry centers in the 1970s and 1980s with a new romanticism that shed modernism with all its cynical baggage. Lyrical, supernatural, narrative, and deft in portrayal of characters, Powell's poems startled many with their freshness, and their sense of being narrated by a timeless voice. She is a prairie twister of a poet. Her people and animals occupy a remembered world of small town and rural America, but they are real--they breathe, dream, bleed and die. Her ghosts and demons spring not from myth, but from your grandmother's rocking chair. This book selects 80 poems from the very best of Powell's passionate, spooky, romantic, and haunting poems. 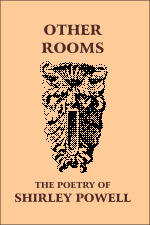 Other Rooms, first published as a hand-bound book in 1997, has been unavailable for some time, and we are deligjhted to bring it back into print. 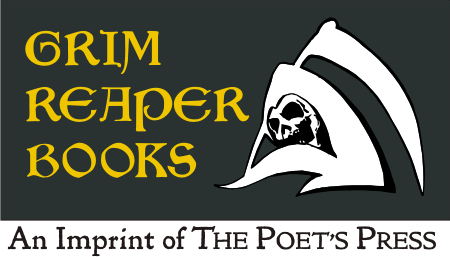 A Poet's Press Grim Reaper Book, $13.95. 6 x 9 paperback, 112 pp. ISBN 978-0-922558-36-0. LAST FLOWERS: THE ROMANCE AND POETRY OF EDGAR ALLAN POE AND SARAH HELEN WHITMAN. 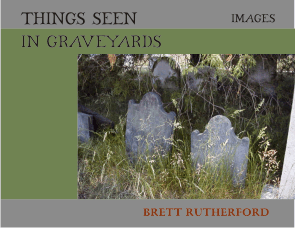 With an essay by Brett Rutherford. Second edition, expanded and revised, 2003/2005, first paperback edition 2008. 160 pp. paperback. $13.96. This is the definitive book on Edgar Allan Poe's doomed romance with Providence poet Sarah Helen Whitman, and the first time her poetry has been available in print since 1916. This book contains the poems both poets wrote about one another, and the best work they might have read to one another during their courtship. The essay traces Poe's 28 days in Providence in detail, as well as the genealogy and family history of Mrs. Whitman. Additionally, an appreciation of Sarah Helen Whitman's highly romantic poetry helps to place her in the pantheon of American women poets where she belongs. 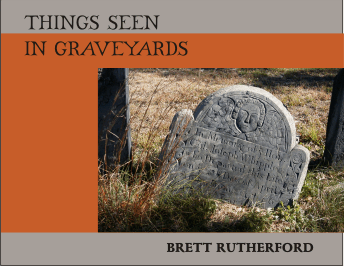 To read Brett Rutherford's Introductory Essay, CLICK HERE. To read the poems, CLICK HERE. Published December 2011. ISBN 0-922558-60-4. 164 pp. 6x9", paperback. $13.95. CLICK HERE to order either/both titles from the Lulu bookstore. THE POET'S PRESS has also issued a new facsimile edition of Barbara Holland's long-out-of-print 1980 chapbook, Autumn Numbers. CLICK HERE to read or download this free Adobe Acrobat (PDF) e-book. JOEL ALLEGRETTI. THE PLAGUE PSALMS. First published in the year 2000 in a hand-bound edition, The Plague Psalms presents a neo-Romantic vision worthy of Baudelaire and Poe: a world haunted by Moorish Spain, the Inquisition, the Black Death, Erik (the Phantom of the Opera), the music of the Oud, and other subjects penitential and pestilential. The book design incorporates wood engravings by Albrecht Durer. This new third edition recreates all the color content of the original. Joel Allegretti is also the author of three other collections of poetry: Europa/Nippon/New York: Poems/Not-Poems (Poets Wear Prada, 2012); Thrum (Poets Wear Prada, 2010); and Father Silicon (The Poet’s Press, 2006). Allegretti’s poems have appeared in The New York Quarterly, MARGIE, Fulcrum, Voices in Italian Americana, Sentence: A Journal of Prose Poetics, Xcp Cross-Cultural Poetics and many other national journals, as well as in The Best American Poetry blog. 98 pp., with color titles and ornaments. 6 x 9 inches, paperback, ISBN 0-922558. NIGHT GAUNTS: AN ENTERTAINMENT BASED ON THE LIFE AND WRITINGS OF H.P.LOVECRAFT. Here is the expanded second edition of Brett Rutherford' s biographical play, Night Gaunts: An Entertainment Based on the Life and Writings of H.P. Lovecraft. The drama portrays Lovecraft alone during his final days, with flashbacks to his childhood, the insanity of his parents, his "Horror Honeymooners" marriage in Brooklyn, and his triumphant solo return to Providence where he established his reputation as the greatest horror writer since Poe. The book also includes a number of "ceremonial" poems written to be read at H.P. Lovecraft's grave in Swan Point Cemetery, Providence. The play has been performed twice at The Providence Athenaeum; was adapted by Hal Hamilton as a radio play by New England Institute of Art in Brookline, Mass. ; and was performed in 2006 at The University of Heidelberg by the theater company Expresis Verbis. ISBN 0-922558-16-7. 94 pages. 6 x 9. $9.95. Local friends and fans of H.P. Lovecraft meet occasionally in Providence for literary, artistic, and social exchange. This publication contains articles, poems, event announcements and fascinating news about all things strange and wonderful. Read the complete run of our newsletters in PDF format. Although these newsletters were published only in 2001 and 2002 they contain some interesting material for fans of H.P. Lovecraft. Books featuring supernatural poetry & writings, both classic and modern.